The Guardian's latest attack on Julian Assange was not only a fallacious smear, it represented a desperate attempt on behalf of the British intelligence community to conflate the pending US charges against the journalist with Russiagate. The article seeks to deflect from the reality that the prosecution of Assange will focus on Chelsea Manning-Era releasesand Vault 7, not the DNC or Podesta emails. We assert this claim based on the timing of the publication, the Guardian's history of subservience to British intelligence agencies, animosity between The Guardian and WikiLeaks, and the longstanding personal feud between Guardian journalist Luke Harding and Assange. This conclusion is also supported by Harding's financial and career interest in propping up the Russiagate narrative. All eyes were on WikiLeaks this week, as lawyers argued for US charges against Assange to be unsealed. Hours before the (Clinton-appointed) judge in the case delaying their ruling for seven days, The Guardian lobbed an unexpected shot across the bow, claiming that: "Donald Trump’s former campaign manager Paul Manafort held secret talks with Julian Assange inside the Ecuadorian embassy in London, and visited around the time he joined Trump’s campaign." Disobedient Media recently reported on evidence indicating that charges against Assange do not relate to Russiagate. 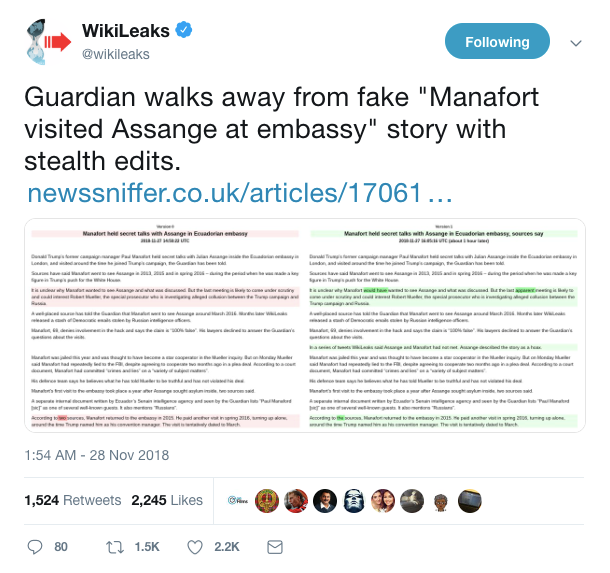 In light of this, one can immediately interpret the Guardian's hit-piece as a distraction intended to tie public perception of Assange's prosecution to the Russiagate narrative by any means necessary. Honesty be damned. "Incredible: The Guardian is running an entirely bogus story as its front page headline just hours before US EDVA hearing on the unsealing of the Assange indictment. Dan Collyns and Luke Harding have been peddling entirely false Russia propaganda for months." Prior to yesterday's hearing, the intelligence community of the UK and US were on the defensive foot, with numerous humanitarian and press-freedom groups speaking out against the United States accidentally-confirmed prosecution of Assange. After the Guardian's hit-piece, WikiLeaks was inevitably forced back into a defensive footing. No matter how ridiculous the allegations published by The Guardian, the current media frenzy is singularly focused - for or against - Assange's alleged link to the Russia-hysteria narrative. "Previously Harding and the Guardian have published documents faked by the Moreno government regarding a diplomatic appointment to Russia for Assange of which he had no knowledge. Now they follow this up with more documents aimed to provide fictitious evidence to bolster Mueller’s pathetically failed attempt to substantiate the story that Russia deprived Hillary of the Presidency." It is not only the Russiagate narrative itself which is "boosted" here, but specifically the fabricated tie between WikiLeaks and that narrative, which as of last week was on the verge of collapsing entirely. To provide important context on Harding's previous journalistic irresponsibility, we recall that he co-authored the infamous book containing the encryption password of the entire Cablegate archive, leading to a leak of the unredacted State Department Cables across the internet. Although the Guardian journalists tried to blame Assange for the debacle, it was they themselves who ended up on the receiving end of some well-deserved scorn. This writer noted that an article published by New Matilda in 2015 illustrated the betrayal by the Guardian in the overlooked history of Cablegate’s release. The same individuals - Luke Harding, and David Leigh - who exposed vulnerable sources in publishing the encryption password ironically labeled Assange callous and arrogant. While most readers with functional critical thinking capacity may readily dismiss the Guardian's smear on its face, the fact that the Guardian published this piece, and that Luke Harding is still operating with even the tiniest modicum of respect as a journalist despite his history of deceit, tells us something bone-chilling about journalism. It is no accident that Luke Harding is still employed: in fact, it is because of Harding's consistent loyalty to establishment, specifically the UK intelligence apparatus, over the truth that determines his "success" amongst legacy press outlets. Harding is not a defacement or a departure from the norm, but the personification of it. We don't just reward bad journalists in our current era: we don't just excuse their fumbles or employ them because of their willingness to propagandize rather than question. We do all of that, but we also actively punish and seek to destroy or silence anyone or any outlet that puts the truth above ideology and does it accurately, a feat in which WikiLeaks is unparalleled in its achievement. Instead, The Guardian's latest smear demonstrates the extent to which what now passes as journalism is utter codswallop intended to manipulate, pacify, deflect, and propagandize, for the benefit of the powerful. Assange's intent, as stated in an old version of his Twitter biographical section, was always the opposite of such dishonest cronyism. The publisher described himself thus: "Refugee; Picking the lock to the chain that enslaves mankind - ignorance. No peace without truth; no war without lies. Viva el Ecuador!" As independent journalist Caitlin Johnstone has often pointed out, the control of the narrative is the means by which the powerful "control the world." 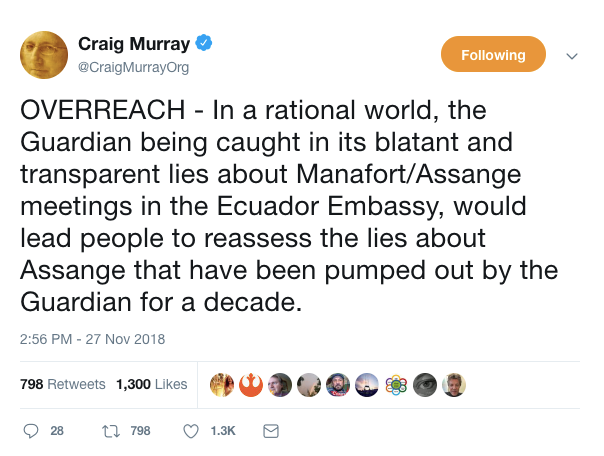 The Guardian's smear represents the means by which the establishment have wrenched back control of the Assange narrative. 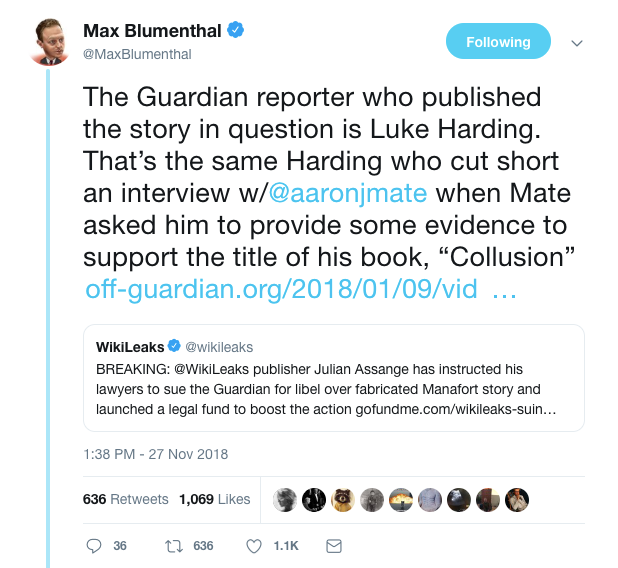 Overall, The Guardian's history as an outlet, the many infractions of its lead fiction writer Luke Harding, and the timing of their outrageously fabricated article, communicate nothing new about the character of WikiLeaks or Assange. Instead, the piece reveals another shoddy attempt to gaslight the public into conflating the ongoing persecution of Assange with the Russiagate fairytale.